We, as human beings, are, of course, earthly minded. We look, during these hurried and harried days, for moments of rewards as counterpoint to the frustrations of our daily interactions with the world around us. We want that gratification to be instant, immediate, now! Our moments of reward, when they do come, are brief, fleeting, and more often than not leave us looking for the next high that must be more intense, longer in endurance–more gratifying. We will never be satiated in this flesh –at least most of us won’t. Considering those of great wealth from as far back as Solomon, and even before him, we can get understanding of just how unsatisfying life can be, no matter how much money and material wealth we garner, no matter how much we achieve. Elvis once recorded a song called, I think, “Fame and Fortune.” In it were the lines: "What good is fame and fortune? They are just fleeting things…” Elvis, of course did enjoy the fame and fortune about which he sang. And, he died at 42. They were for the king of rock and roll, indeed, just fleeting things. The writer of Ecclesiastes, who almost certainly was Solomon, wrote that after he had tasted all of the world’s delights –both those that were allowed, and those forbidden—he found them all to be self-centered, and in vain. He then gave his assessment of life in this human flesh, and what really matters: “Let us hear the conclusion of the whole matter: Fear God, and keep his commandments: for this is the whole duty of man. For God shall bring every work into judgment, with every secret thing, whether it be good, or whether it be evil” (Ecc. 12:13-14). We will all come to the end of our fleshly lives. We will stand before God. This is what is called sometimes jokingly, but with a serious undertone, “Going to our eternal rewards.” I wrote the following as a chapter a few years ago for my book, Prophecy Power: Strength from God To Face Your Future. You can see at the end of the article where you can get a copy of the book, if you wish. “For we must all appear before the judgment seat of Christ; that every one may receive the things [done] in [his] body, according to that he hath done, whether [it be] good or bad” (2 Corinthians 5:10). We who are of a certain generation remember a TV show in the late 1950s called “This is Your Life!” Each week, the host, Ralph Edwards, would come on the air, whispering, usually holding a large book under one arm and a microphone in the other. He would look directly at us through our (black and white) TV screens and then glance nervously around him while the camera panned from him to see if it could locate the guest of honor for the evening’s program. Finally, someone would walk into the bright glare of the television spotlights on some sidewalk in New York or elsewhere. That person would have another person in tow, and would tug him or her toward Ralph Edwards. The person in tow would appear to be greatly surprised, his mouth and eyes widening in disbelief when he realized he had been tricked into coming to the spot so “This is Your Life!” could spend the next 30 minutes –minus commercials—going over his life for the TV viewers. We who are Christians have a review of our lives coming that will be much greater in scope than the biographies Ralph Edwards did on any of the celebrities he reviewed for many years. Not one moment of our lives will be missed by our reviewer because the one who will review our lives from start to finish will be none other than the Lord Jesus, himself! We will look in this lesson, of course, at the “judgment seat of Christ” and all it will encompass. Only the saved will be at this judgment, which is not a judgment for sins committed, but a bema judgment that will be for determining our eternal rewards. As one prophecy teacher I know says, “You’ll find that description of Judgment Day in the Bible in the same place you’ll find the story of Rudolph the Red-Nosed Reindeer." Sadly, far too many Christians have no more idea of what God’s review of their lives will be like than that described above. This study is meant to help us understand, as thoroughly as God’s Word allows, what one of the major judgments following life on this planet will be like. Each person who has ever been born has a destiny that includes standing before Almighty God. There’s no escaping it. You and I will stand before the one, true God, the Creator of all things. The writer of Hebrews tells us: “…it is appointed unto men once to die, but after this the judgment…” (Hebrews 9: 27). Make no mistake, we will one day stand before the SUPREME COURT! Not only will there not be one long line where we stand in dread for a few thousand years awaiting our turn, but there will not be one judgment; there will be two. The first judgment to take place will be the bema judgment, also called “the judgment seat of Christ.” The second --the final judgment-- will be “the great white throne” judgment. You do not want to be at the second of these two judgments--not unless you are there as witness to God’s righteousness, rather than as one who is being judged. You do, definitely, want to be at the first judgment. This is because only the saved stand before Christ at the first judgment, and only the lost stand before God at the second. Everyone at the first judgment will go into Heaven to live eternally in God’s presence. Everyone who stands before God in the second judgment will go into Hell, apart from God for eternity. Prophecy Power will cover the great white throne judgment in a later study. We will look at the judgment seat of Christ for now, to get a handle on exactly what Bible prophecy says awaits each of us who name the name of Jesus in the intimate way essential for salvation. Have you ever admired a great athlete and wished you had that kind of ability? The super athletes of our time make the big bucks, garner great attention, and seem to thrive with rewards of their tremendous feats. More Super than Super Bowl! God’s Word tells us that we are competing in a contest that is supernatural, and that has eternal consequences. All who are on God’s team are expected to give it their very best effort in this great race we call life. Paul the apostle likens our competition to a number of athletic events. The analogy is to the competitions of the Olympic games of ancient times. Christians are in competition that involves far more profound consequences than do the athletic feats accomplished by even the world’s greatest athletes in earthly sports events. The competition is with ourselves. It is individual. We should strive to achieve our utmost potential in order to give honor and glory to our Lord Jesus Christ, by whom and for whom we were made. Paul was a man of many facets, not just some guy walking around spouting pious things. He was a tremendous scholar, a great missionary and evangelist, and a tentmaker. He was also a terrific sports fan. We can know that Paul was indeed a fellow who followed the athletic competitions of his day with great relish from his writings. He used analogies and allusions to sport terms in his instructions on how God wants us to live our lives. He refers in the following to such a sports analogy: “Wherefore seeing we also are compassed about with so great a cloud of witnesses, let us lay aside every weight, and the sin which doth so easily beset us, and let us run with patience the race that is set before us, Looking unto Jesus the author and finisher of our faith; who for the joy that was set before him endured the cross, despising the shame, and is set down at the right hand of the throne of God” (Heb. 12:1-2). Paul based much of his sports analogy on his knowledge of the bema of athletic competitions of his day. One writer clues us to what Paul was talking about in this analogy: “In the large Olympic arenas there was an elevated seat on which the judge of the contest sat. After the contests were over, the successful competitors would assemble before the bema to receive their rewards or crowns. The bema was not a judicial bench where someone was condemned. It was a reward seat. Likewise, the judgment seat of Christ is not a judicial bench. The Christian life is a race, and the divine umpire is watching every contestant. After the Church has run her course, He will gather every member before the bema for the purpose of examining each one, and giving the proper reward to each” (Levin Strauss, God’s Plan for the Future, Zondervan, p. 111). The great apostle indicated that at the end of his own life he was satisfied he had given all he had for his Lord, who is also his Judge: "For I am now ready to be offered, and the time of my departure is at hand. I have fought a good fight, I have finished my course, I have kept the faith: Henceforth there is laid up for me a crown of righteousness, which the Lord, the righteous judge, shall give me at that day: and not to me only, but unto all them also that love his appearing” (2 Tim. 4:6-8). How thrilling! Did you catch that? Paul says in this prophecy that not only he, but we who run the race with all we have, will also receive great rewards. But he says more than that. He prophesies that there is a special reward for Christians who “love His [Jesus’] appearing." Now that’s an empowering truth for those who look for the Lord Jesus at any moment in the rapture! A person, at the moment he accepts Christ, is instantly placed upon a rock-solid foundation. The truth of that foundation is found in the following: “He saith unto them, But whom say ye that I am? And Simon Peter answered and said, Thou art the Christ, the Son of the living God. And Jesus answered and said unto him, Blessed art thou, Simon Barjona: for flesh and blood hath not revealed it unto thee, but my Father which is in heaven. And I say also unto thee, That thou art Peter, and upon this rock I will build my church; and the gates of hell shall not prevail against it” (Matt.16:15-18). Jesus was not saying here that Peter was the rock upon which salvation is based, but that Jesus is that Rock. This foundation stone is the same stone that will smash all anti-God, Antichrist humanistic government at Christ’s second coming (Dan. 2:34-35). Paul the apostle says about Jesus, the foundation: “For other foundation can no man lay than that is laid, which is Jesus Christ” (1 Cor. 3:11). Some teach the error that we must work to earn and maintain our salvation. The Scriptures above plainly teach otherwise. There is no other foundation whereby we can become God’s child: “Neither is there salvation in any other: for there is none other name under heaven given among men, whereby we must be saved” (Acts 4:12). So, our immortal souls can never be in danger of facing God’s wrath, once we are upon the foundation, which is His blessed Son, Jesus. Nonetheless, our eternal destiny is still subject to influence, based upon how we live our lives while still in this realm of earthly existence. You see, we, when we are set upon that unshakable foundation–the Lord Jesus Christ—we immediately begin building on that solid Rock. We send the materials ahead of our trip to glory –whether that trip be through death or the rapture-- for constructing our eternal dwelling place, and for making our heavenly wardrobe. In that sense, our works while in this life do affect our eternal destiny. The building materials we send ahead in the form of our works on this earth will have to pass God’s test to determine their worthiness for heavenly construction. The testing will take place at the bema –the judgment seat of Christ. Here’s what God’s Word has to say about that moment of testing for each of us: “For we are labourers together with God: ye are God's husbandry, ye are God's building. According to the grace of God which is given unto me, as a wise masterbuilder, I have laid the foundation, and another buildeth thereon. But let every man take heed how he buildeth thereupon. For other foundation can no man lay than that is laid, which is Jesus Christ. Now if any man build upon this foundation gold, silver, precious stones, wood, hay, stubble;Every man's work shall be made manifest: for the day shall declare it, because it shall be revealed by fire; and the fire shall try every man's work of what sort it is” (1 Cor. 3:9-13). Paul, under divine inspiration, is quick to tell us that this judgment in no way will determine whether the person being judged is allowed to enter Heaven. The one being judged is eternally secure from the very moment of salvation. Paul writes about the bema judgment further: “If any man's work abide which he hath built thereupon, he shall receive a reward. If any man's work shall be burned, he shall suffer loss: but he himself shall be saved; yet so as by fire” (1 Cor. 3:14-15). We must each stand before the judgment seat of Christ to give an account of what we did while living on earth. We will either receive rewards or suffer loss of rewards. The good works we do in the sight of God are symbolized as made of gold, silver, and precious stones. Our worthless works are represented as wood, stubble, and hay. While we stand before the bema, heavenly fire of righteousness will be applied to each work we did in life. The gold, silver, and precious stones will stand the test by fire, and all dross (useless, excess) will burn off. Only the pure, refined works will remain. All other works will perish in the heavenly fire. Again, this has nothing to do with salvation of our souls. That was settled the moment we accepted Jesus as Savior, while still in physical life on earth. Jesus will then bestow upon each believer his or her rewards, based upon the refined gold, silver and precious stone works that have been tested in the fires of supreme judgment. 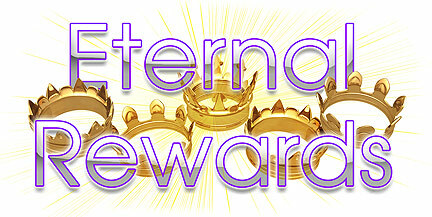 The greatest reward of all will be to hear our Lord say to us the same thing the master said to his servant in the story Jesus told while teaching: “His lord said unto him, Well done, thou good and faithful servant: thou hast been faithful over a few things, I will make thee ruler over many things: enter thou into the joy of thy lord” (Matt. 25:21). Although it’s not easy to know exactly what goes into making a gold, silver, and precious stone work, or a wood, hay, and stubble work, God’s Word informs us about certain, general areas of life where God is particularly interested. We will look scripturally, and in-depth in Session 12 at the crowns that will be given at the bema. We will, with equal scriptural intensity, look in Session 13 at the areas of living life on earth in which the Christian will be tested at the judgment seat of Christ. For now, it is the greatest banquet that will ever be held that takes stage-center in God’s prophetic program. What a contrast this banquet will be to the feast taking place on Planet Earth! We read about that grotesque earthly banquet: “And I saw an angel standing in the sun; and he cried with a loud voice, saying to all the fowls that fly in the midst of heaven, Come and gather yourselves together unto the supper of the great God; That ye may eat the flesh of kings, and the flesh of captains, and the flesh of mighty men, and the flesh of horses, and of them that sit on them, and the flesh of all men, both free and bond, both small and great. And I saw the beast, and the kings of the earth, and their armies, gathered together to make war against him that sat on the horse, and against his army. And the beast was taken, and with him the false prophet that wrought miracles before him, with which he deceived them that had received the mark of the beast, and them that worshipped his image. These both were cast alive into a lake of fire burning with brimstone. And the remnant were slain with the sword of him that sat upon the horse, which sword proceeded out of his mouth: and all the fowls were filled with their flesh” (Rev. 19:17-21). The human carnage will be stupendous. But, it will be Righteous Judgment that is well deserved. The carrion of earth will indeed have their fill! The Church Age saints of God whom the Bible says have white robes of righteousness will be the wife of the Lamb (Jesus Christ). This is the bride the Apostle Paul wrote about as follows: “Husbands, love your wives, even as Christ also loved the church, and gave himself for it; That he might sanctify and cleanse it with the washing of water by the word, That he might present it to himself a glorious church, not having spot, or wrinkle, or any such thing; but that it should be holy and without blemish. So ought men to love their wives as their own bodies. He that loveth his wife loveth himself. For no man ever yet hated his own flesh; but nourisheth and cherisheth it, even as the Lord the church: For we are members of his body, of his flesh, and of his bones. For this cause shall a man leave his father and mother, and shall be joined unto his wife, and they two shall be one flesh. This is a great mystery: but I speak concerning Christ and the church” (Eph. 5:25-32). A number of views on exactly who the bride will be have been a cause for debate. The purpose here is to present what God’s Word says, advising each child of God to study, pray and seek Holy Spirit direction while considering this awesome topic of prophecy yet future. The Scripture on the marriage supper of the Lamb we are given specifically says: “Let us be glad and rejoice, and give honour to him: for the marriage of the Lamb is come, and his wife hath made herself ready. And to her was granted that she should be arrayed in fine linen, clean and white: for the fine linen is the righteousness of saints. And he saith unto me, Write, Blessed are they which are called unto the marriage supper of the Lamb. And he saith unto me, These are the true sayings of God” (Rev. 19:7-9). The bride will forever be with her Lord, the King of all Kings. All saints of all ages will have different duties to perform and offices to administrate, but the body of believers who constitute the Bride of Christ will be with Him forever in a special relationship, while serving Him as He wills, based upon bema rewards earned while during earthly life. To get a copy of Prophecy Power: Strength from God To Face Your Future, call toll-free 1-800-264-2482.